Pumpkins evoke memories of the autumn season; whether placed in a fall or Thanksgiving display or carved into scary looking jack-o’-lanterns. This type of winter squash boasts more than decorative good looks, it can be baked in pies and bread and the seeds can be roasted for snacks. In the garden, pumpkins love lots of moisture, compost-enriched soil, and plenty of sun. Meet those requirements, and these sprawling vines will bear a bumper crop of orange-skinned pumpkins that you can carve, cook, or store. Pumpkin vines are vigorous, covering lots of ground. To keep your garden from being engulfed by vines, plant seedlings along one edge of the garden and train the vines toward the outside of the garden. 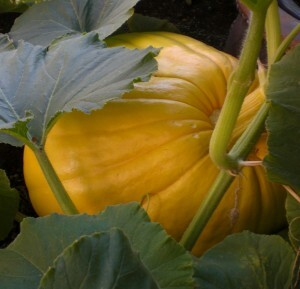 Pumpkins need a lot of water when the flowers and fruit are forming otherwise, the fruit won’t develop to full size. Side-dress the plants with compost or balanced organic fertilizer when the first blossoms appear. If a vine sets too many fruits, they will compete for sugars and nutrients, and all of the fruit will be small at maturity. Remove some of the developing fruit from each vine to produce larger fruit, especially for jack-o’-lantern-type pumpkins. If pumpkins lay directly on the ground, they develop a flat, warty, unattractive side. To avoid this problem, place newspaper or cardboard under each fruit. Also, turn each fruit over once or twice during the growing season. 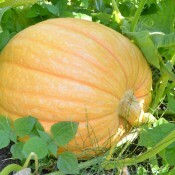 Companion plants for pumpkins include corn, marigolds, melons, nasturtiums, oregano, and squash. Harvest pumpkins before first frost. Fruit is ready for harvesting when it is fully coloured, the rind is hard, and the stem begins to shrivel and dry. Pumpkin vines are often prickly, so wear gloves and long sleeves for protection. To harvest, cut stem with a sharp knife, leaving 2 inches (5cm) of stem attached on fruit. Handle them carefully: Never lift a pumpkin by its stem; if the stem breaks off, there will be entry point for decay. Cure pumpkins at 85-90°F (29-32°C) for a week to two weeks to harden the rind and seal the stem. Then move the cured pumpkins to a cool area to store. Ideally, the storage area should have temperatures of 50-60°F (10-15°C) and humidity of 50 to 75 percent. Under the right conditions, the pumpkins can be stored for 2 months or longer.